The finca Consists of two double bedrooms and one single bedroom, bathroom with shower, seperated kitchen and living room with sitting and eating area. From the living room you step on the big porch with a sitting area for four persons. Outside there is an additional sun heated shower, a long dining table, enough space for parking two cars, a garden with a slide for the children. The spacious plot is fully fenced. There is a second terrace with two chairs and there are two sunbeds. From within the sleeping rooms and the living room you have the most beautiful view on the coastline and the landscape. Outside the views are even more impressive. Also outside there's a BBQ area and place to sit in the shade. The kitchen is fully equipped, there is Wi-Fi, Spanish television and of course all bed and kitchen linen are included. Finca Marquez is ideal For Those seeking tranquility while being close to the beach and Conil. The plot is located Approximately 5 kilometers from the beaches from Conil de la Frontera, in the zone De La Vigia. From these hills you have beautiful views on the Costa de la Luz. Zone De La Vigia does have notes own small village center with a supermarket. The finca is made of natural materials as much as possible and all efforts are Aimed to have as little impact as possible on the environment. The finca is fully self-sustaining; partyly powered by solar panels and water has been extracted from a private well. This is clean water That originates from the mountains of Cadiz. The waste water has led to an underground biological Septi-tank That filters the exhaust and biodegrades. Hot water for showering and cooking is generated by a gas boiler. Thanks for this wonderful stay Meredith! We were really impressed by the beautiful surroundings and the lovely comfortable house. 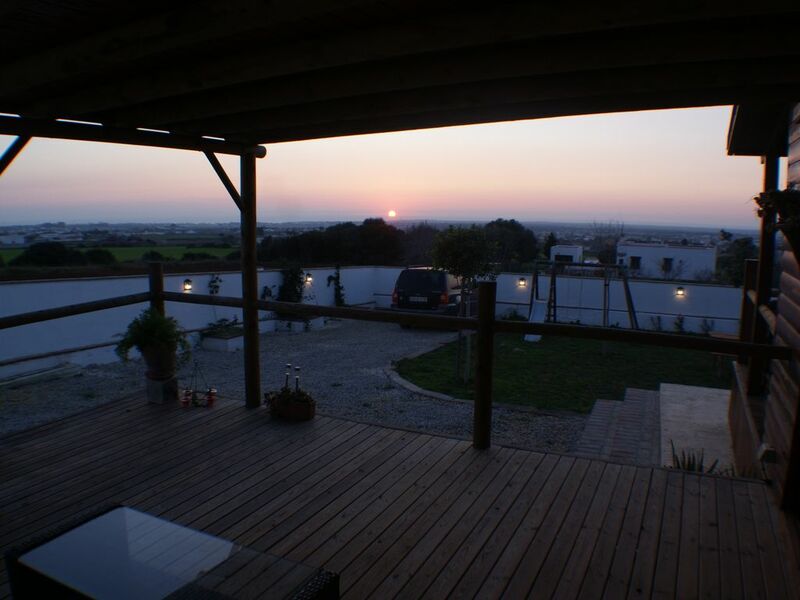 We have had almost every night an amazing sunset from the spacious wooden terrace. During the day, we often went to the beach or hiking in the area. The wooden house feels so good, very comfortable. Its complete with outside even a picnic table, 2 sun beds, an outdoor shower on solar, fruit trees etc. The electricity is provided by solar and the water is from the well. So we were aware of our consumption, its a nice concept. We had a wonderful 2 weeks and I would definitely recommend this house. The owners are very friendly and easily accessible. Thanks for this wonderful stay Meredith! Meredith and Jeffrey are lovely hosts, warm and welcoming, fun to talk to and easy to communicate with. They really helped us with our lost luggage and went above and beyond. Thank you! eigen watervoorziening. Hierdoor ervaar je dat bewust omgaan met energie zonder enig probleem mogelijk is. Het huis is een goede uitvalsbasis voor bezoeken aan de witte stadjes in de directe omgeving maar ook voor de grotere toeristensteden als Sevilla , Cordoba, Cádiz etc. Wij zijn zeker van plan om terug te gaan. Landelijk gelegen, ruim uitzicht over landschap, dorpjes en de oceaan. Grote parkeerplek, leuke terras/tuin [ in ontwikkeling ] schitterende ruime veranda. Leuke inrichting van woonkamer en 3! slaapkamers [+keuken en badkamer]. Ecologisch verantwoorde water- en electriciteitsvoorziening. Een aanrader voor liefhebbers van rust en ruimte! In sept.2014 hebben wij 2 heerlijke weken doorgebracht in Finca Marquez in Conil de la Frontera. Een ruim, vrijstaand, mooi houten huis, met een heerlijke schaduwrijke porche. En met weids uitzicht over landerijen, dorpjes en Atlantische Oceaan, en iedere avond zicht op de ondergaande zon! Het huis is gezellig ingericht, schoon, prima bedden , linnengoed, en voorzien van Nederl.TV en WiFi. Bovendien heeft het huis een aantal duurzame eco-elementen zoals zonnepanelen, eigen waterput en een buitendouche op zonne-energie. In de tuin in groei, met gras, struiken en bomen, houten speeltoestel, zonnebedden en picknickset, was het ook goed toeven. Finca Marquez is een heerlijk rustgevende plek om bij te komen van de westerse stress! Het lijkt ons hier ook een ideale omgeving om b.v. een boek te schrijven, muziek te componeren, te schilderen of lange wandelingen maken. Er is hier nog rust en ruimte! Dit huis wordt door ons van harte aanbevolen voor een geweldige vakantie in het mooie Andalusie! If you want rooms with a view, a taste of authentic Spain, lots of beautiful weather, near one of the nicest beaches around and the possibility to have a great night out on the town, Finca Marquez has it all! I stayed in the finca for seven weeks last summer. The house is self sustainable, it also likes the sun :-), and ticks all the boxes to make your stay in Andalucia a great succes. Whether you love to produce some sweat cycling up and down the hills, hit the road by car to visit all the lovely spots in it's surroundings or just kick back and enjoy the superb view. I truly recommend this spot, and would advise to rent a car, to enjoy as much of the Costa de la Luz as possible. Peace, quiet, beaches, sun, or get wild in the cities nearby. It's all there for the taking! And as a bonus, the house sunstains itself. So if you're eco footprint matters to you, this is your spot!